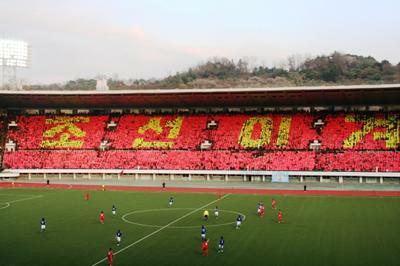 The DPRK beat longtime rivals Japan in the qualifier for the 2014 World Cup held in Kim Il Sung Stadium on November 15th 2011. 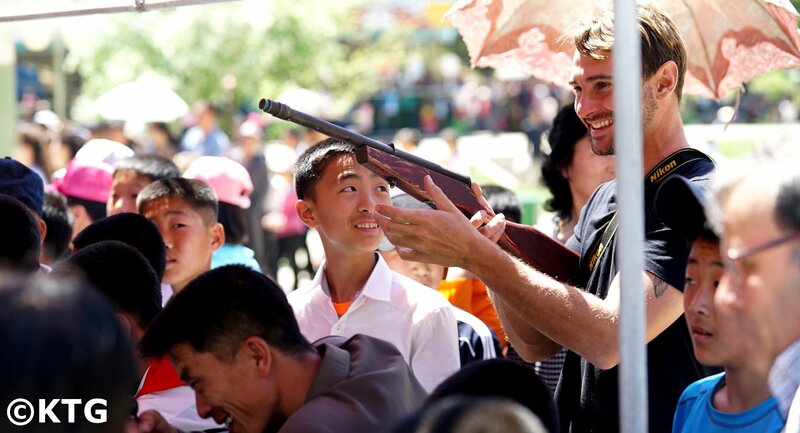 The game saw the local side pressuring from the start of the game in front of over thousand euphoric North Koreans. 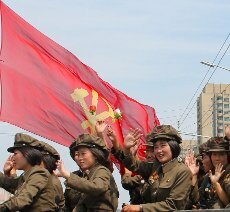 Thousands of DPRK flags, a constantly cheering crowd and a mosaic banner in red and yellow similar to those used in the Mass Games backdrops made by thousands of Koreans created a highly tense atmosphere for the Japanese. Jong Tae-Se, the Japanese-born North Korean strike remembered by many for shedding tears when the DPRK’s anthem was played in the North Korea’s World Cup opening game vs Brazil, had several clear chances. He was surprisingly substituted after around 30 minutes in what was seen as attempt of the Korean coach to confuse the Japanese players and coach who are used to Jong Tae-Se’s style (as he plays in the Japanese league) and had created a defensive strategy to contain his movements. Japan found it hard to control the ball under the constant attack of the Chollimas and in spite of the constant pressure the game score was 0-0 by halftime. In the beginning of the second half, Japan had some chances and saw their first corner kick but it was Pak Nom-Chol who scored after a mighty header in the 50th minute of the game causing the crowd in the stadium to go ecstatic. As the game went on it became tenser and the local side saw no less than 8 yellow cards, including two yellow cards for Jong-Il Gwan. The Japanese side tried to increase the strength of its attack by introducing Mike Havenaar, a Japanese player of Dutch origin, and Tadanari Lee. However the Chollimas, backed by a roaring crowd, kept their goal safe and beat the Japanese in what can be described as a strongly physical match. Despite not being able to qualify for the World Cup, this game was seen as an extremely important one given historical and political rivalry between the two countries. Celebrations on the pitch, with the game heroes holding the DPRK flag and a euphoric cheering crowd show just how seriously the game was taken. 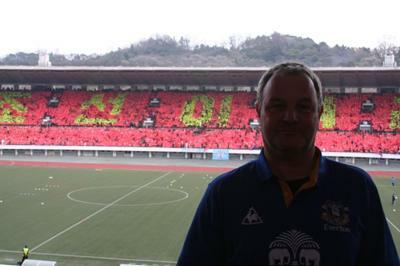 Attached are some pictures taken by one of our travellers, an avid Everton fan, Mark Revell, who saw the game live in Pyongyang. Thank you for sharing them with us Mark! Thanks for your comment! The game was actually in Pyongyang, not Japan. "Sadly" depending on who you ask. 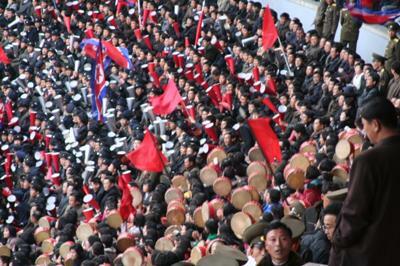 The stadium was packed and the match showed on TV in North Korea several times. 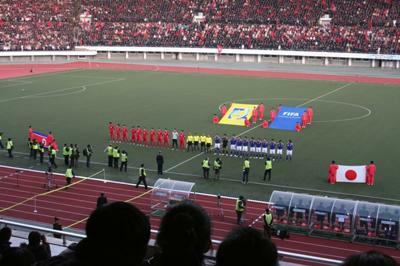 Although DPRK had no options of qualifying for the game, it was considered a great victory in North Korea, given who the other team were (traditional rivals and probably the best Asian team). We had a small group then and were lucky to bump into the Japanese football team at the airport before the game. Reminds me of my trip to Japan! I was so lucky to get a ticket to watch the match. It was an amazing experience. The crowd was all charged up. Sadly Japan lost the match 1-0 in the World Cup Qualifier. North Korea Un-Official World Champions! The DPRK actually became Un-official World Champions, a non-official title that has been held since the first international friendly game in history! For any football fans this link may be of interest to you!